Extreme brightness changes observed on a nearby tiny brown dwarf star may indicate a storm grander than any yet seen on an alien world, scientists say. A small, dim star appears to be wracked by a mega storm more violent than any weather yet seen on another world, astronomers announced. The star, called a brown dwarf, is more massive than a giant planet but much lighter than most stars. Over a period of several hours, the star exhibited the largest brightness variations ever seen on a cool brown dwarf. Radigan will present a paper on the findings this week at the Extreme Solar Systems II conference in Jackson Hole, Wyoming. Scientists think climate patterns on brown dwarfs are similar to those on giant planets, so studying this super squall could help illuminate weather on alien planets. Clouds on giant planets and brown dwarfs are thought to form when tiny dust grains, made of silicates and metals, condense. 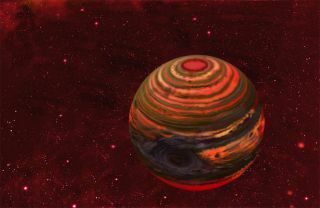 "We might be looking at a gigantic storm raging on this brown dwarf, perhaps a grander version of the Great Red Spot on Jupiter in our own solar system, or we may be seeing the hotter, deeper layers of its atmosphere through big holes in the cloud deck," said University of Toronto astrophysicist Ray Jayawardhana, author of the recent book "Strange New Worlds: The Search for Alien Planets and Life beyond Our Solar System." The researchers observed the star, called 2MASS J21392676+0220226, using the infrared camera on the 2.5-meter telescope at Las Campanas Observatory in Chile. They made repeated observations over several months, and found that the brightness variations differed as the weeks wore on. "Measuring how quickly cloud features change in brown dwarf atmospheres may allow us to infer atmospheric wind speeds eventually and teach us about how winds are generated in brown dwarf and planetary atmospheres," Radigan said. The researchers submitted their paper to the Astrophysical Journal.